En el centro de Denia, Alicante, encontrarás Les Monges. 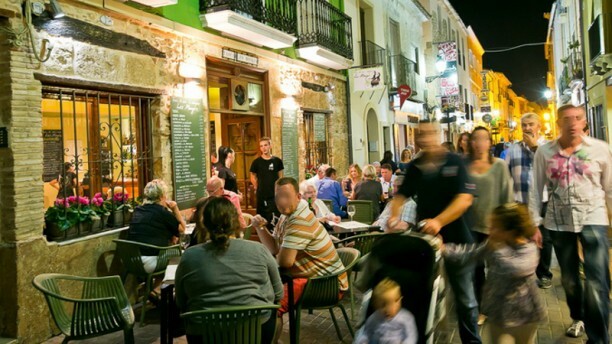 Está bonita tasca te ofrece una cocina tradicional y casera donde podrás degustar lo mejor de la gastronomía mediterránea. Arroz a banda, mejillones Sor Ángela, entrecot gallego, pulpo, chipirones... Tapas y platos de siempre llenos de sabor. Disfruta de la buena comida en Les Monges. As good as ever, excellent service. Really good value. Another fabulous evening at this gorgeous restaurant. Food is excellent and great value for money and the atmosphere is lovely. One of my favourite restaurants by far. We will be back soon. When we were ready to order the waitress was finding it very difficult to raise a smile, thing she had a grumpy pill with lunch. We were very pleased with all the dishes that we ordered. We kept with the tapas menu which was in Spanish and English, the recommended wine of the day was good. No complaints and would go back. The tapas were really good and the taste was excellent. We have eaten four tapas: the roasted squid, the capaccio of ox, the mussel and the scampi in garlic roasted. All tapas were good and the portion was big enough. This restaurant is so good, that you must order a table in advance or you find no seat. The service is friendly and quick. So we have ordered directly a table for Sunday again. Absolutely recommendation!!! We were a party of 7 and ordered lots of differant tapas, which were all delicious. Portions are big. The staff very good and the service was excellent. Fabulous food... ordered too much though! Lovely atmosphere too! Will definitely be returning. Such a lovely little find! I took my friends thinking they would love it as I had been before. Unfortunately the food was ok but the service poor. We were basically left alone and had tocall a waiter each time we needed something - drinks or the next course! The waitresses were all mates and chatting to each other. I won't return. Great night had by all ???????? Nice place in picturesque part of Denia. Quick and friendly staff, decent prices, good selection and tasty food. Recommended! Excellent food, good service but to noisy when full with people.